The young Robert Louis Stevenson, living in a boarding house in San Francisco in the 19th century while waiting for his beloved’s divorce from her feckless husband, dreamed of writing a soaring novel about his landlady’s adventurous and globe-trotting husband—but he never got around to it. And very soon thereafter he was married, headed home to Scotland, and on his way to becoming the most famous novelist in the world, after writing such classics as Treasure Island, The Strange Case of Dr. Jekyll and Mr. Hyde, and Kidnapped. But now Brian Doyle brings Stevenson’s untold tale to life, braiding the adventures of seaman John Carson with those of a young Stevenson, wandering the streets of San Francisco, gathering material for his fiction, and yearning for his beloved across the bay. 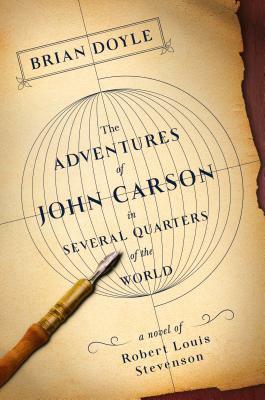 An adventure tale, an elegy to one of the greatest writers of our language, a time-traveling plunge into The City by the Bay during its own energetic youth, The Adventures of John Carson in Several Quarters of the World is entertaining, poignant, and sensual.